Trousers – “For me, or not for me?” That is the question! Grrrr, I have to confess to major irritation with my trouser toiles. It seems the Hot Patterns patterns don’t suit me. Not the garments & certainly not the instructions! I set about making a toile of each of the patterns I wanted this weekend. When I use a pattern for the first time, I like to use the instructions as printed, then I can see where to deviate (if necessary) the next time. All was well until I got to the fly zip. Now I can do a fly zip, 5 minutes & it’s done. The instructions for these patterns bamboozled me to such an extent I ripped the entire lot out & threw it on the floor for 30 minutes while I stormed downstairs for tea & chocolate! I don’t know who the instructions are written for, but they made absolutely no sense to me whatsoever. One I’d calmed down I returned to the scene of the crime & inserted the zips my way. Done. Then to put them on – yeah. They don’t sit right, & I don’t like them – either of them – at all!! Apparently they’re “really easy to make following all the tutorials on youtube”. I don’t want tutorials on youtube!! If you cannot make the instructions clear enough on the item I paid money for, I’m not interested! gggrrrrr. Daughter No2 loved this pattern when she spotted it in the BurdaStyle magazine back in November. I have some beautiful damson stretch twill with a satin finish from Croft Mill Fabric that will look fabulous made in this pattern. I traced the pattern this morning & made a toile in some spare fabric, a madly printed cotton. I used it because it was the only piece I had that was the right size & roughly the right feel for the finished garment. I reconned without Daughter No2’s wacky taste. The minute she saw them she thought they were the “real thing”! You’ve never seen such excitement – & then disappointment when I said it was just a toile! You seem to be a similar body shape to mine. I can’t get Vogue pants to fit, but can work a Burda pattern almost without alteration. I guess if Burda pants fit then why go with another company – after all there is a lot of choice aver a few issues. Don’t fix what’s broken, ey? I love those crazy print trouses by the way – would keep them as well. 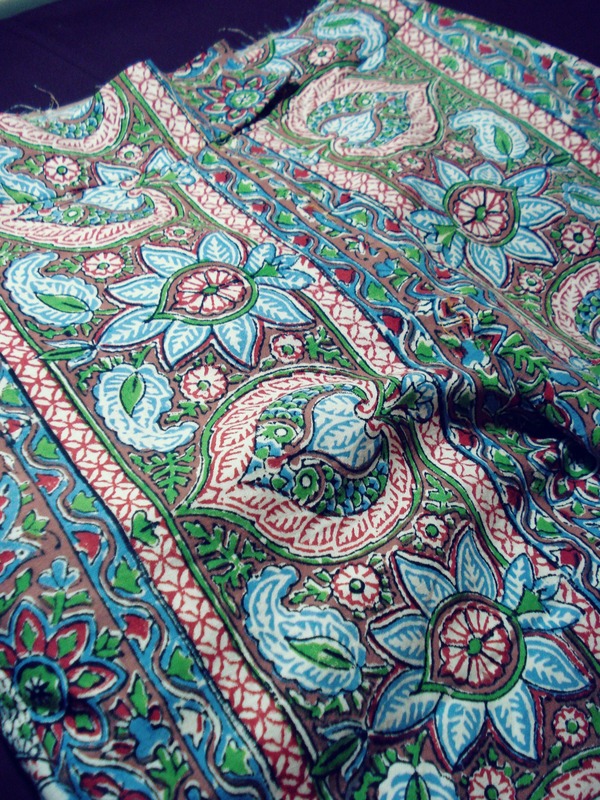 Good trouser patterns seem pretty elusive… I’m still hunting for a pattern I could call tried/trusted/true. I wish you luck in your quest! I have a couple of tried & tested Burdas, I’ve lost track of how often I’ve used those 3 or 4 patterns, but I was on the hunt for something new. I guess Chris has it right, if it ain’t broke, don’t fix it! My Burda work pants are my go to. I’ve managed well with Jalie and Vogue jeans. I agree that the instruction in the pack should be all you need. Daughter no 2 should be doing the happy dance with these trousers. She sure is! Within the week she’ll have two new pairs instead of just the one! I am going to leaf through the marked Burdas tonight & see if I can narrow down the list a bit. Oooh, I like that fabric and the pattern for those trousers. Which Burda patterns did you find were good? I am now sewing Burda 7141 and the instructions are not good, and the pattern is huge, but it has been rather simple to just take them in here and there. I’ll get them out of the file, all are traced from magazines. haha, yes, I can totally see that! I can say the Burda trousers are now finished, awaiting photography tomorrow when, hopefully, we will be without rain or clouds. Sometimes you have to try different to find new greats. Sadly, this doesn’t seem to be one of the greats! I really wanted them to work, I love the shapes!! I guess I will have to draft something, or make a Burda pattern my next love. I tried Hot Patterns too and did not like them at all. The fit was completely off. You are not alone. 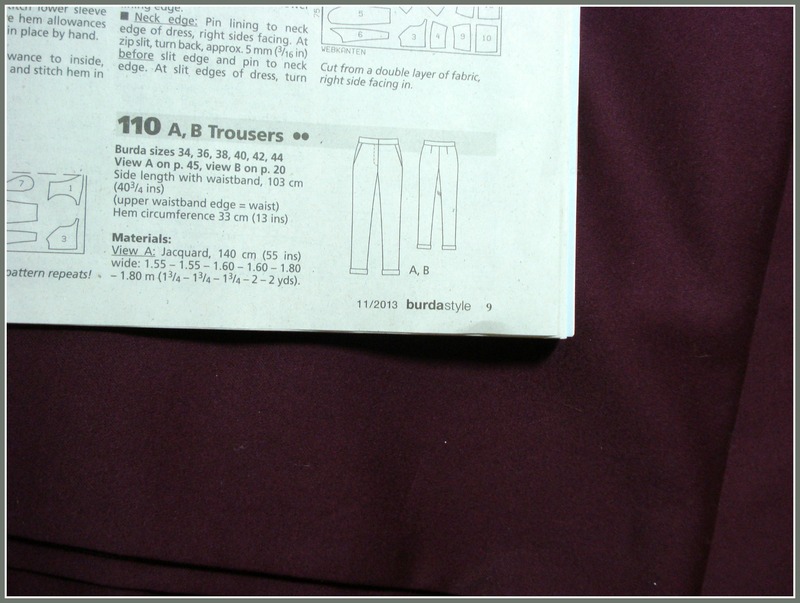 I haven’t tried Burda trousers. Must add that to the list.